I just wanted to point regular readers here to Birds on the Blog where I have signed up as one of the team of regular bloggers. My first piece is out over there. Obviously this will not affect Planet Germany. Just a quick alert for anyone in Düsseldorf on October 3rd. I will be appearing at Teatime and Cellos on Planet Germany. The event is organised by Rhinebuzz. It will be an afternoon of fabulous classical music interspersed with me reading funny passages from Planet Germany . It starts at 5 p.m. (that’s 17.00 if you’re German) and will be at Kwadrat, Blücherstrasse 51, Düsseldorf. I really hope to meet some of my regular readers there! This week the very excellent Christoph Driessen wrote an article for dpa which was syndicated to news sites all over Germany, including Bild, Welt Online, T-Online, Web.de, Focus Online… to name but a few. 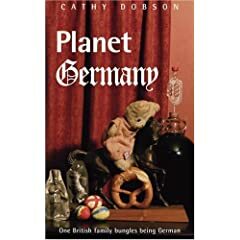 His article looks at the unusual portrayal of Germans by various travel guides and other books – including Planet Germany. Of course for a gripping article it was essential to pick up on some of the quirky or even downright insulting descriptions of teutonic habits and characteristics which are picked up by the authors – myself included. The parts praising teutonic qualities and virtues don’t make good news copy. But what really struck me was how the different headline writers have had a field day. There seems to have been a competition to see who can sensationalise this story most. announces T-Online… conjuring images of the imminent collapse of a German tourist industry, dependent on beer swilling Brits to keep the Oktoberfest in business. Rechnen Sie mit gedüngten Körperregionen! suggests the Sueddeutsche. Good grief! This must be about mud wrestling gone mad! If anyone else spotted any other good ones out there, please let me know! I love German humour! Would you recognise yourself described in a tabloid? This is a new experience for me…. what with all the PR around Planet Germany, I’m used to the language of book reviews and Amazon blurb. But all of a sudden, I’ve started being written up in the popularist press. Great PR! I’m really pleased of course. But will I ever get used to the way I’m described in it? Mum of three Cathy Dobson. Excuse me? Isn’t the reason you’re writing the article that I’m an author? How about successful writer Cathy Dobson? 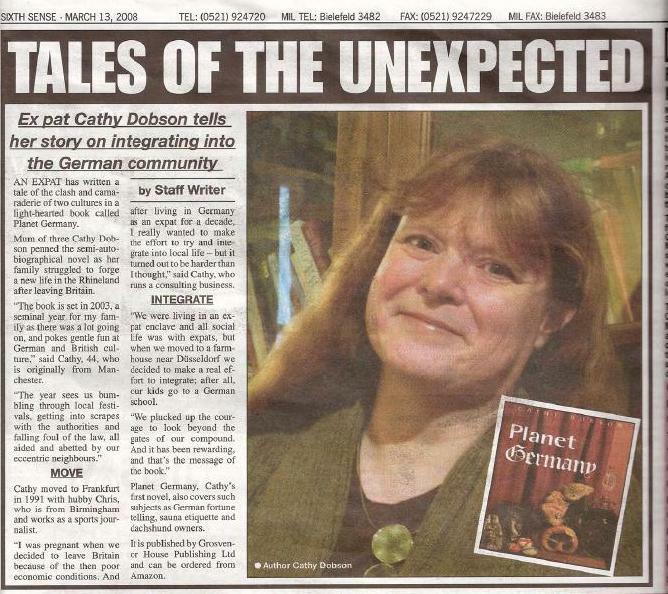 Or even bestselling author Cathy Dobson? But no… in the tabloid world I’m an appendage, apparently. Cathy moved to Frankfurt in 1991 with hubby Chris, who is from Birmingham and works as a sports journalist. Hello! Can anyone see me? I have a career too! I run my own business! Hello….over here! Oh never mind….